Superior fit, expert craftsmanship, easy concealment, and durability – these qualities embody every 1791 Gunleather magazine holster. We produce the finest leather gun magazine holsters used by sportsmen, veterans, law enforcement, armed security guards, and American patriots across the country. No one wants a drawer full of not-quite-right magazine holsters. We all want that one perfect leather magazine pouch we can wear comfortably and securely all day. Choose from Signature Brown, Classic Brown, Stealth Black, or Black on Brown in attractive finishes designed to match your favorite gun holsters. We offer single magazine holsters for single or double-stack mags, as well as double magazine holsters for single or double-stack mags. 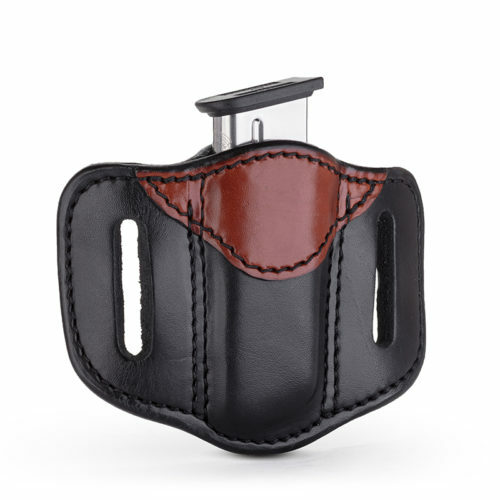 The open top design allows for quick draw, no matter your carry style. Superior Fit – Single or double-stack, your mags will be held securely in place without scratching or deformity. Concealment – Easily conceal an outer waistband pouch with a quick draw design perfect for everyday carry. Craftsmanship – See and feel the difference of our 100% Certified American Heavy Native Steerhide Leather. Comfortable Safety –The strong, American steel clip is beveled for maximum comfort and safety retention. Durability – Our handcrafted, molded exteriors are reinforced with double-stitching for superior reliability. Lifetime Warranty – Buy a holster to last generations, with guaranteed satisfaction and hassle-free returns. We pride ourselves in delivering superior quality leather products at exceptional value. 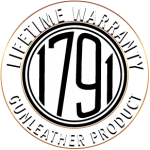 Exclusive, 1791 Gunleather products are sold in over 1,200 retailers across America. Though we are a relatively young company, our retail presence and internet sales continue to skyrocket as our presence and reputation for quality gain the respect and name recognition in the field. Check out our praising our expert craftsmanship and customer service. Each magazine holster purchase comes with a free leather key ring, which new customers say is “a nice touch.” Should you have any questions, concerns, or need for returns, we will make sure you’re taken care of, without worrying about extra shipping charges or restock fees. We strive to deliver the ultimate magazine holster for all your conceal-and-carry needs, whether you’re carrying for self-defense, employed in law enforcement, or shooting for sport. We are passionate about our Second Amendment rights and the responsible gun owners we support. Do You Need A Magazine Holster? There are two main reasons to invest in a good magazine holster. First, if you’re carrying a gun for self-defense, there is always the chance you’ll need more ammunition than what you have in your pistol. Many defensive shootings are over with a single shot, but some are not. There are no widespread studies on the number of bullets expended per self-defense shooting, but the anecdotal evidence is compelling. For instance, outside a nightclub in Texas, two brothers shot a mugger seven or eight times before he ran off. A Georgia woman — holed up in her attic, defending her two children from an assailant, shot the man five times in the face and torso before he relented his attack. We can also look at police studies for indication of what it takes to effectively deter criminal activity. The Police Policy Studies Council reported that the NYPD averaged 5.2 shots per office in gun fights between 1990 and 2000. Plenty of incidents resolve in one or two shots, but an FBI Miami shootout in 1986 took more than 80 rounds and a North Hollywood shootout in 1997 required over 650 rounds. There are all kinds of uncertainties in emergency situations. Will your aim be good? What if you drop a round? What if the gun malfunctions? Another reason to invest in a magazine holster is for added convenience at the shooting range or out in the field. A holster is much lighter and easier to carry around with you than a full gear bag. Better than strapping on a tactical jacket, a magazine holster is one of the handiest ways to keep your ammo accessible at all times and transport it from one place to another with ease. 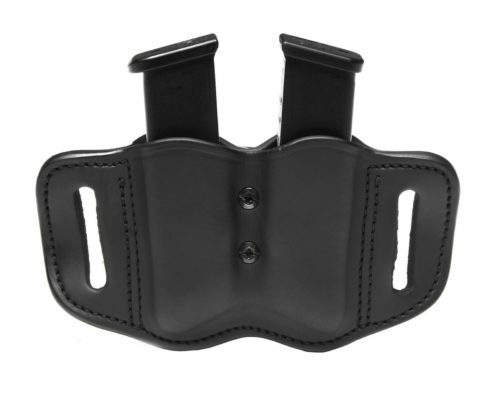 A concealed magazine holster comes in two forms – the IWB magazine holster that goes inside the waistband, and the OWB magazine holster that goes outside the waistband. Some people like IWB carriers for total concealment within the waistband even when they are wearing neatly tucked shirts, but the OWB magazine holster is by far the most popular concealed-carry option due to its comfort and ease of use. Custom outer waistband holsters allow for a showing of personal style. You don’t need to buy larger pants to accommodate extra room in your waistband. You can wear your OWB holster anywhere, as not all courses, ranges, or places allow IWB holsters. With an OWB, you can safely keep firearm munitions on you at all times, rather than setting them on a table. You can still conceal your ammunition by untucking your shirt or wearing the right kind of jacket. OWB carry positions allow better room to quickly grip onto the rounds and load them into your pistol. OWB holsters are most comfortable for wearing at home when there is no need to conceal a firearm. America’s earliest ammunition consisted of arrows in a quiver. Later, we arrived at cartridges containing pre-measured black powder and round balls wrapped in paper, carried on the musketeer’s belt during battle. At the turn of the 19th Century, the smaller guns of the time were easily stowed in a coat, vest, or pants pocket, while larger pistols were wedged into the waistband. Pommel bag holsters were popular during the California Gold Rush era for game hunting and protection. Pieces of rolled leather were sometimes used for carrying a single-shot pistol on a belt. By the 1830s, saddle makers and leather artisans were eager to fill the rising demand for comfortable carrying holsters, following the release of Sam Colt’s new, more accurate cap-and-ball revolver. The advent of metal cartridges in 1845 led to the demand for cartridge belts. The California loop belts were popular during the Civil War and among buffalo hunters throughout the 1860s. By the late 1800s, the Mexican loop holster inspired other designs that allowed wearers to carry different types of ammunition for different types of guns. At the turn of the 20th Century, holsters were adorned with nickeled brass studs, contrasting rawhides, detailed border stitching, carvings, and stampings, which added character to an otherwise functional product. 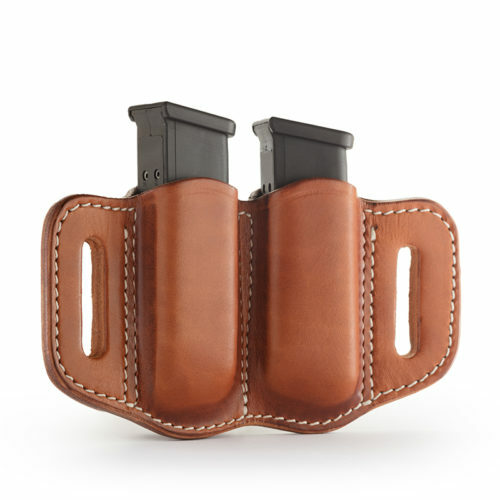 Modern magazine holsters are made from leather, synthetic materials like nylon, or even hard plastic. But in our opinion, nothing beats the attractive look and natural feel of genuine, high-quality leather! Contact 1791 Gunleather to find the best quality leather magazine holster on the market for a price you can afford – and never look back. 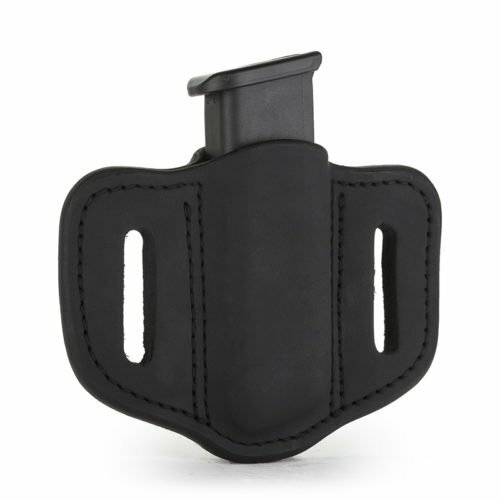 Our holsters fit belts up to 1 and ¾ inches, and our multi-fit design is handcrafted to accommodate a wide range of ammunitions and firearms with few exceptions. We stand behind our products with only the highest customer service standards. Become part of our family of proud patriots! 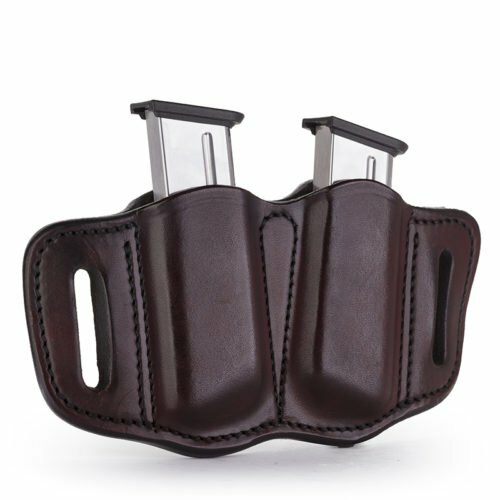 When the time comes to purchase your next gun and magazine holster, experience the difference in our full range of Certified American Heavy Native Steerhide Leather products.